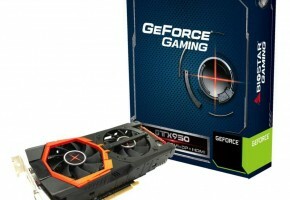 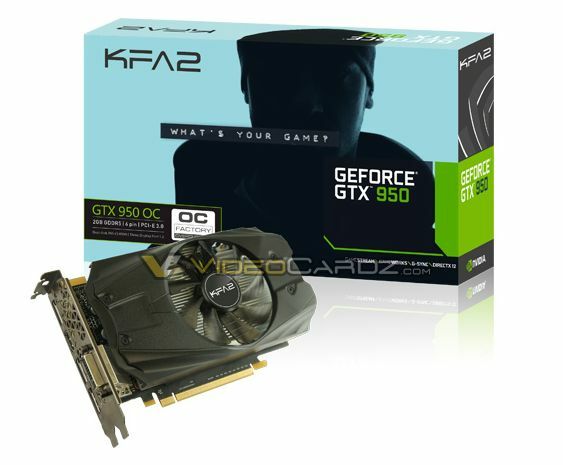 Tomorrow NVIDIA will introduce a new mid-range graphics card called GeForce GTX 950. 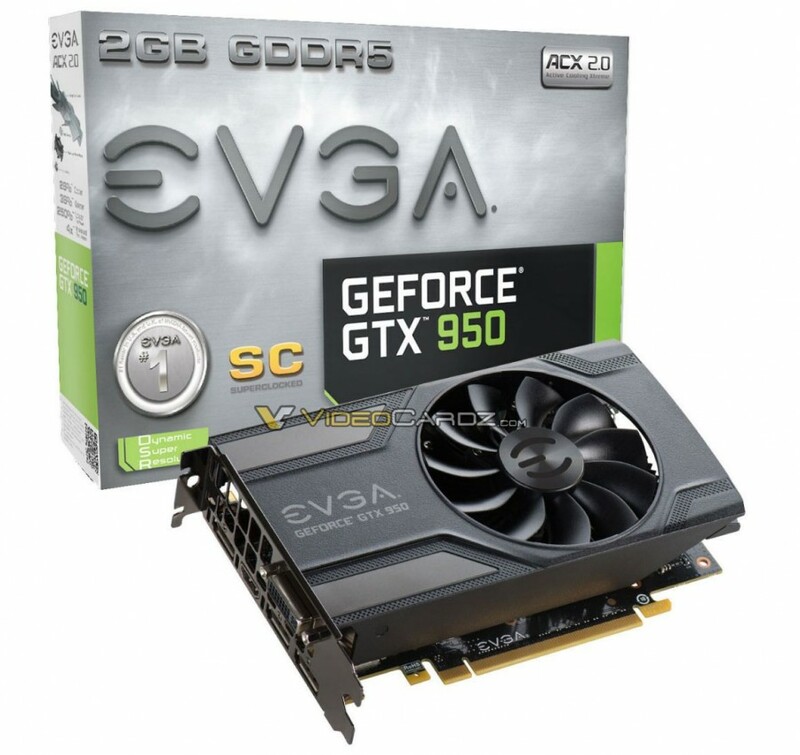 The new budget-oriented graphics card has arrived. 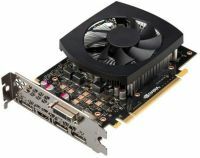 GeForce GTX 950 is new model based on Maxwell architecture, featuring 768 CUDA cores and 2GB GDDR5 memory across 128-bit interface. 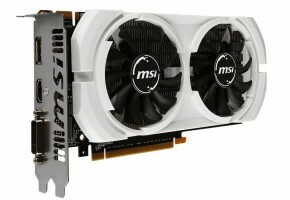 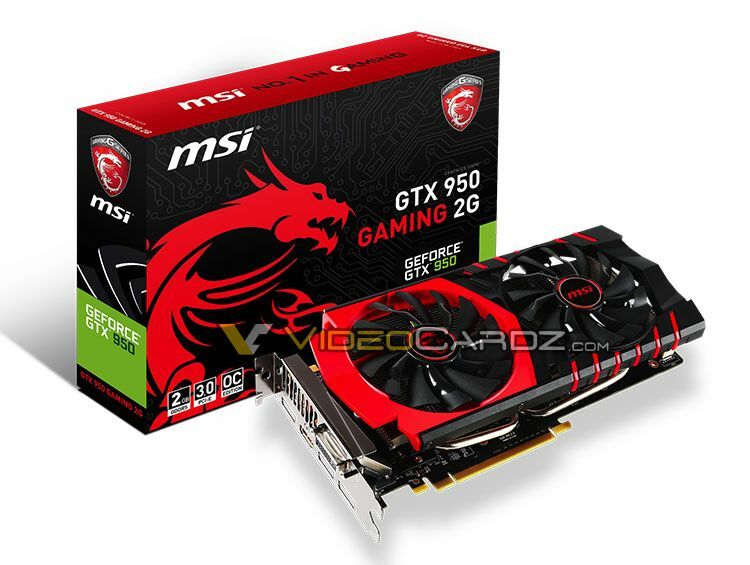 It’s a proper GTX 750 Ti replacement, although it is being compared to GTX 650 by NVIDIA. 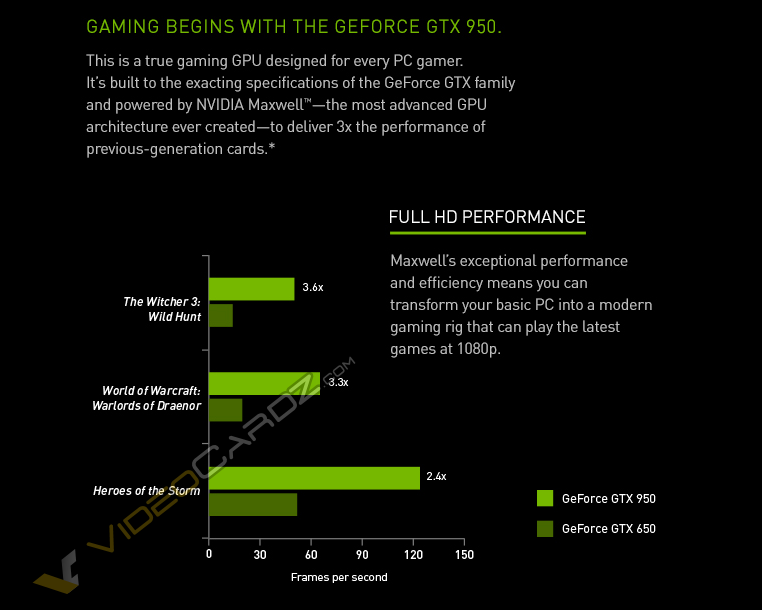 The GTX 950 is based on the same GPU as GTX 960, which is Maxwell GM206 with 6 Streaming Multiprocessors enabled. 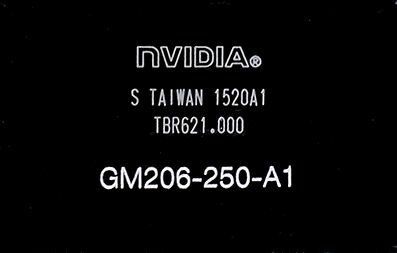 On a side note, it is believed we might be seeing a third card with GM206 GPU and 7 SMs enabled in the coming weeks (aka GTX950Ti). 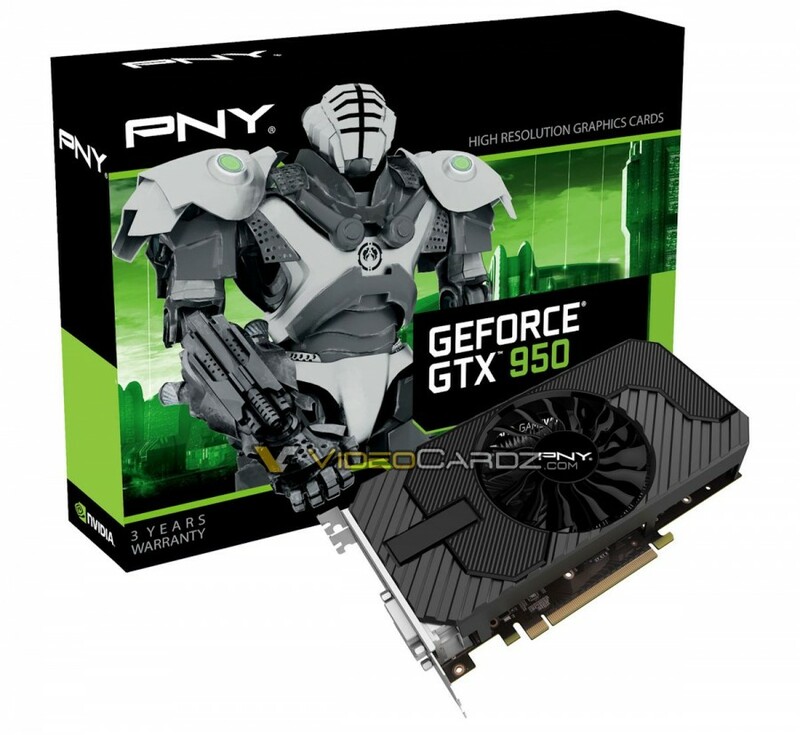 Probably the most interesting part of GTX 950 are power requirements. It’s a sub-100W graphics card with TDP rated at 90W. 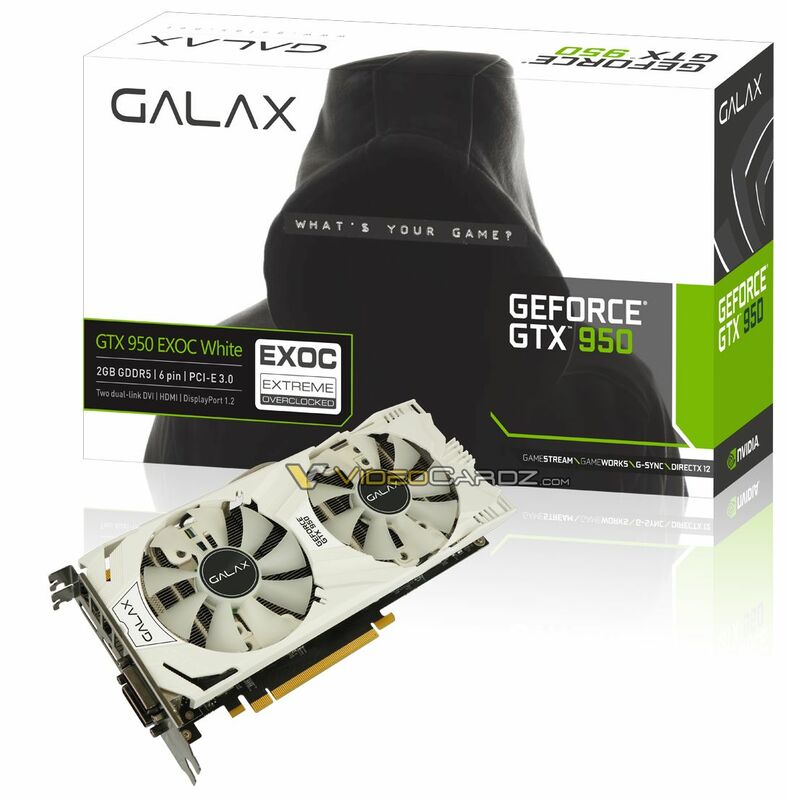 It’s 30W more than GTX 750 Ti, but also 30W less than GTX 960. GeForce GTX 950 has has no problem overclocking/boosting to 1.4 GHz, thus power consumption will likely rise above the specs. 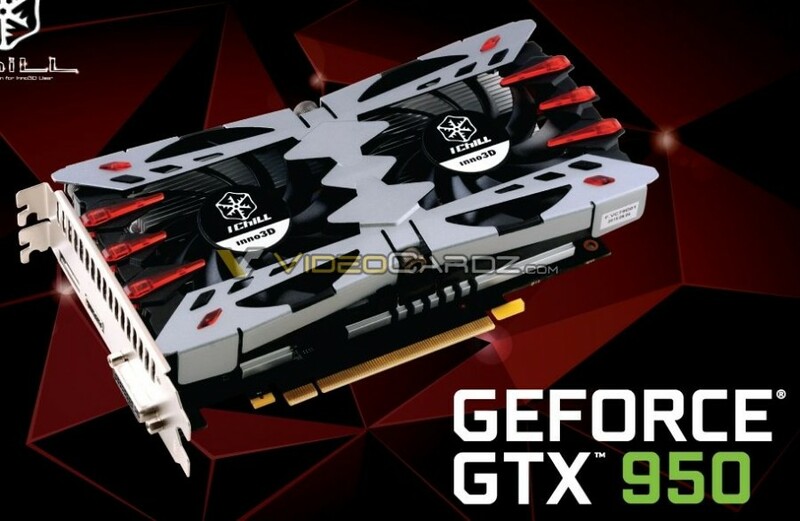 The reference card is quite similar to GTX 750 Ti. 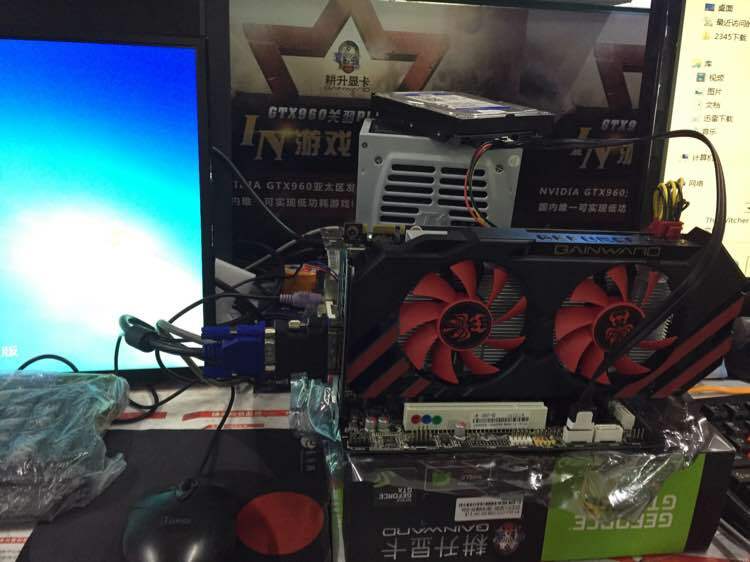 It’s a dual-slot open air cooler, not the blower type we know from GTX 960. 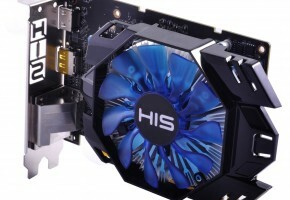 Reference model has 5 display connectors including DVI-I, HDMI 2.0 and three DisplayPorts. 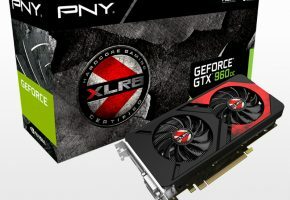 The card should be available for sale this week. 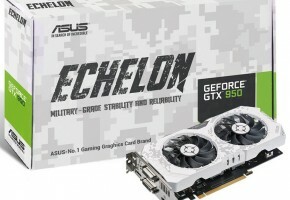 The price has been confirmed at 159 USD. 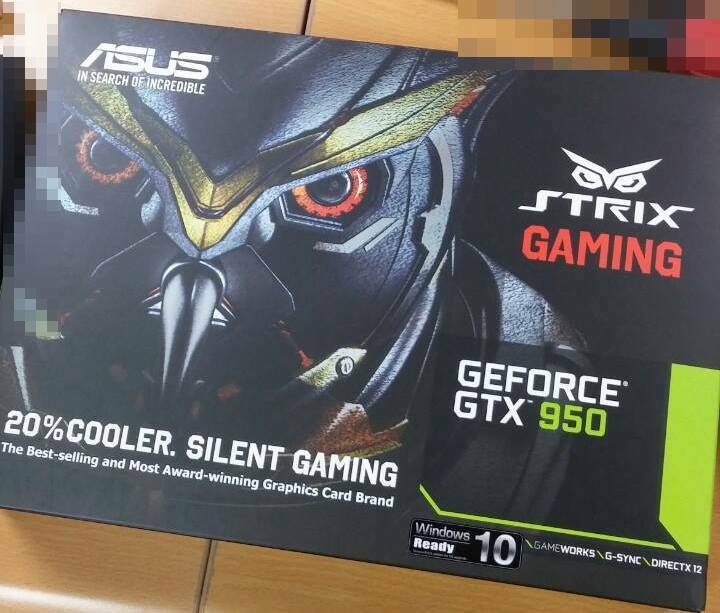 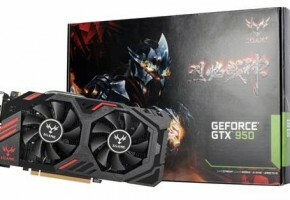 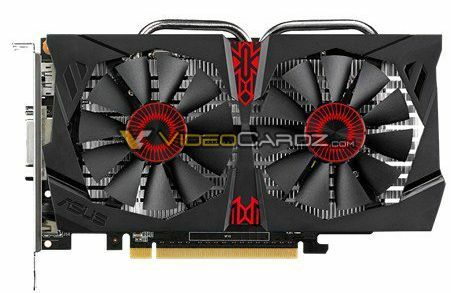 ASUS STRIX is not exactly a copy of GTX 960. 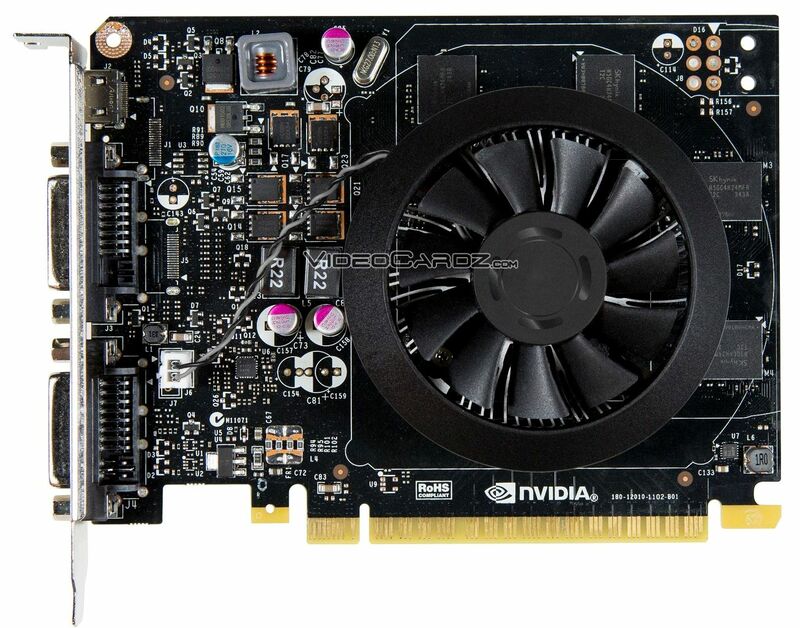 In fact it looks just like STRIX GTX 750, with DVI ports in the middle of the I/O bracket. 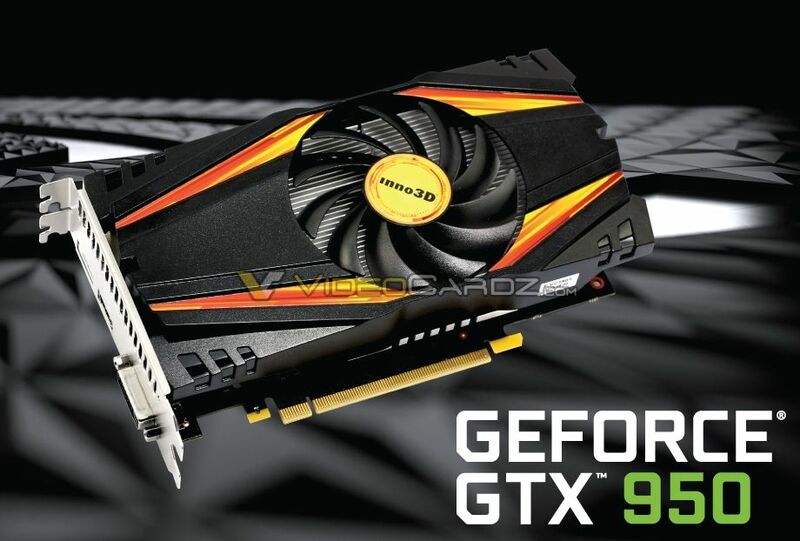 Also the heat pipes are situated at the top, not at the bottom like on STRIX 960. 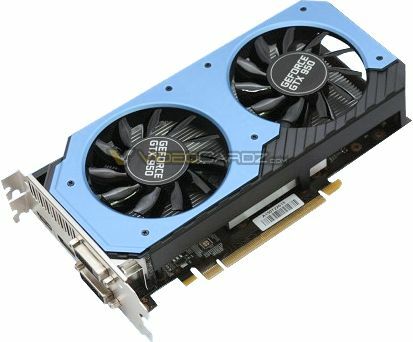 This card has non-reference clocks at 1152/1342 MHz with memory clock at 6610 MHz. 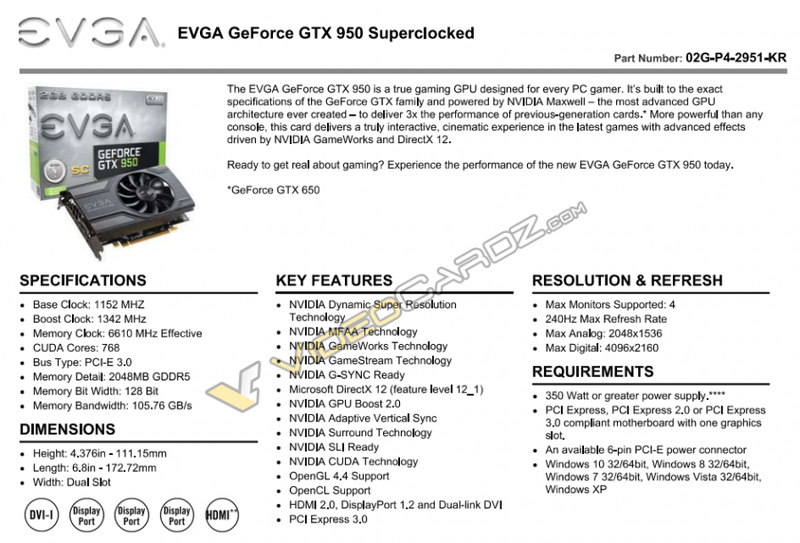 As the name suggest Super-Super Clocked comes with very high frequencies out of the box. 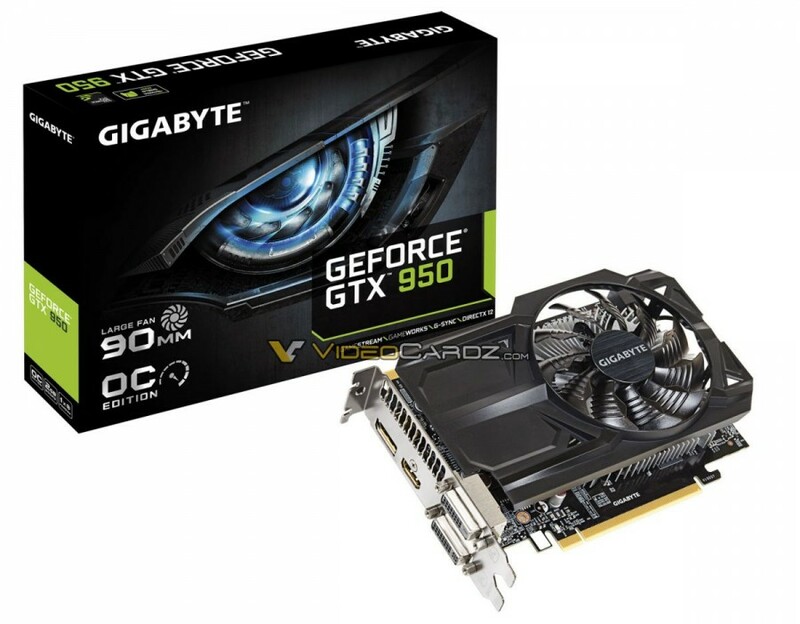 With base clock at 1190 MHz and boost clock at 1393 MHz, we might be looking at one of the fastest GTX950 cards around. 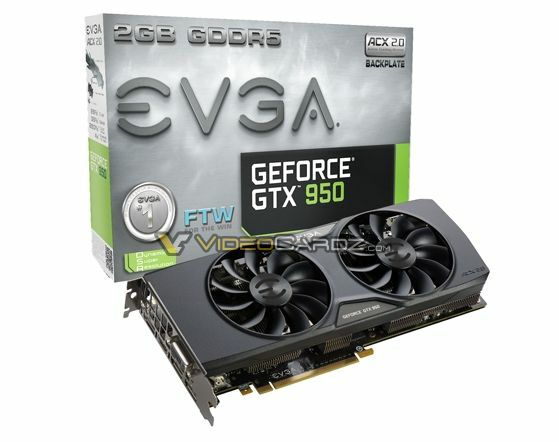 I don’t have specs for these two yet, but FTW should be the fastest card in EVGA lineup. 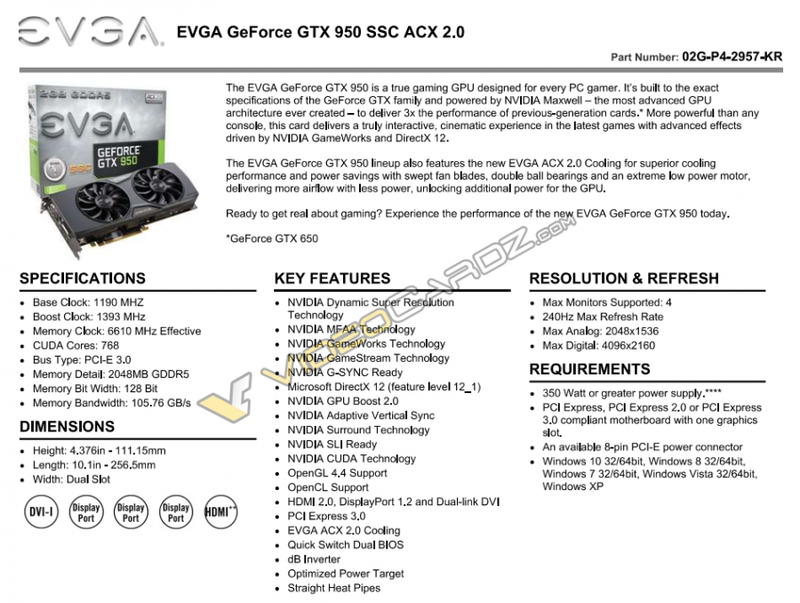 The first card is running at reference speed, meanwhile the GTX 950 OC comes with 1102/1279 MHz configuration. 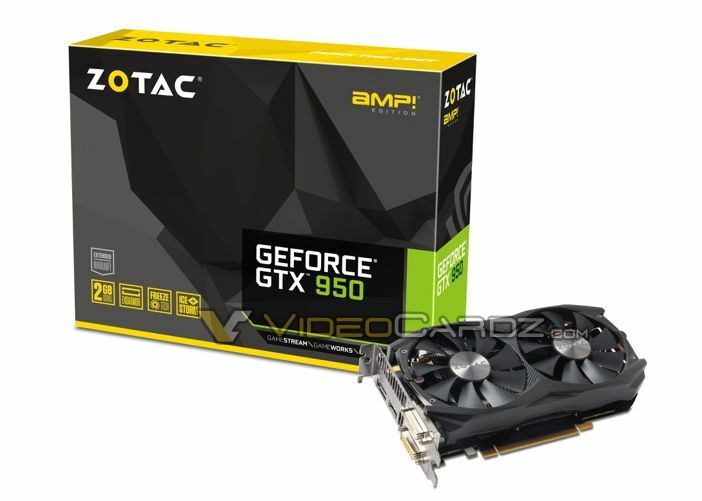 The AMP! 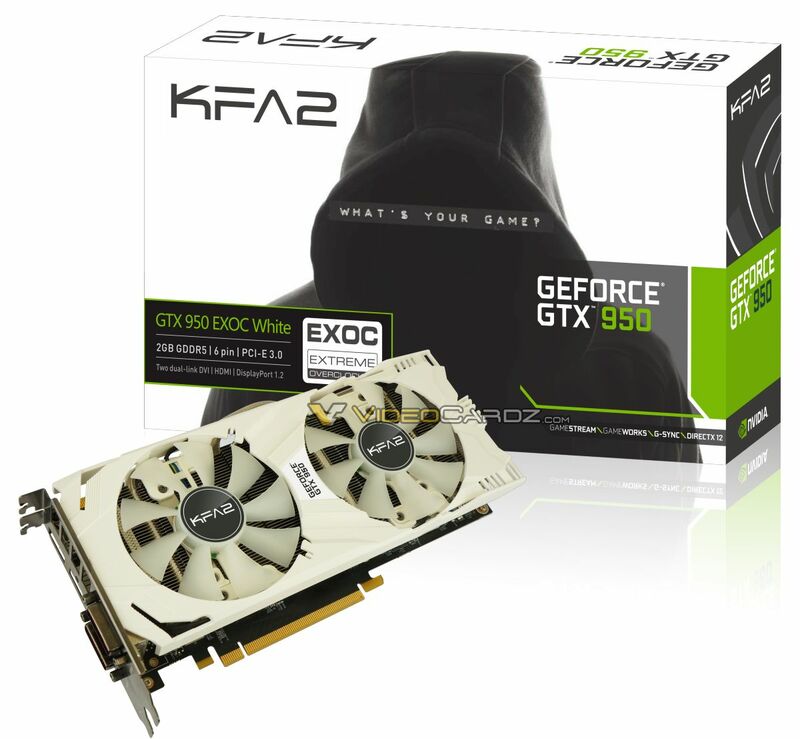 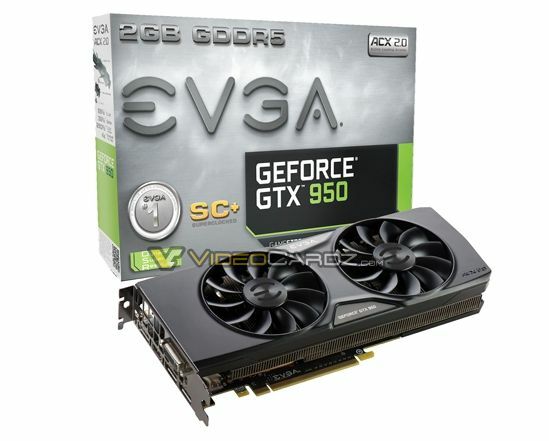 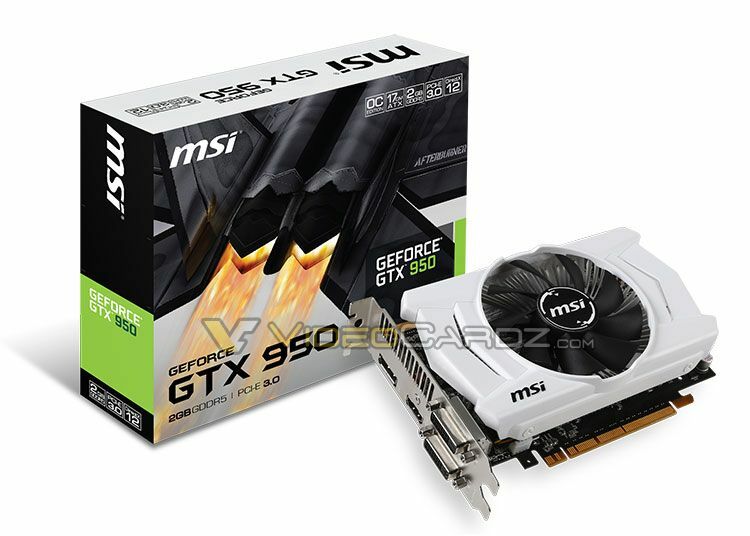 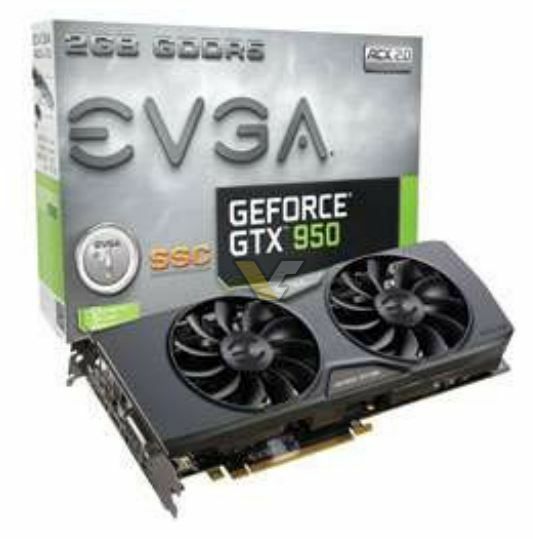 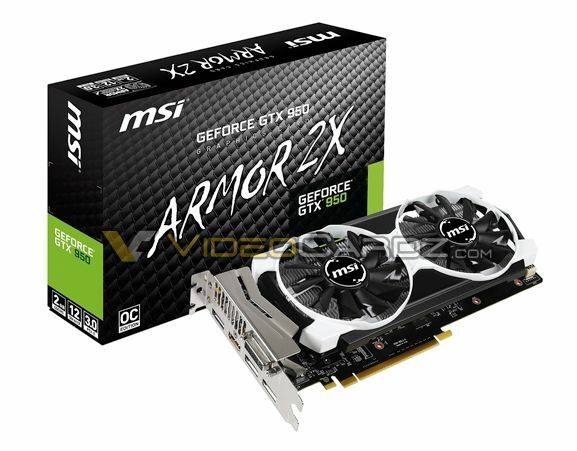 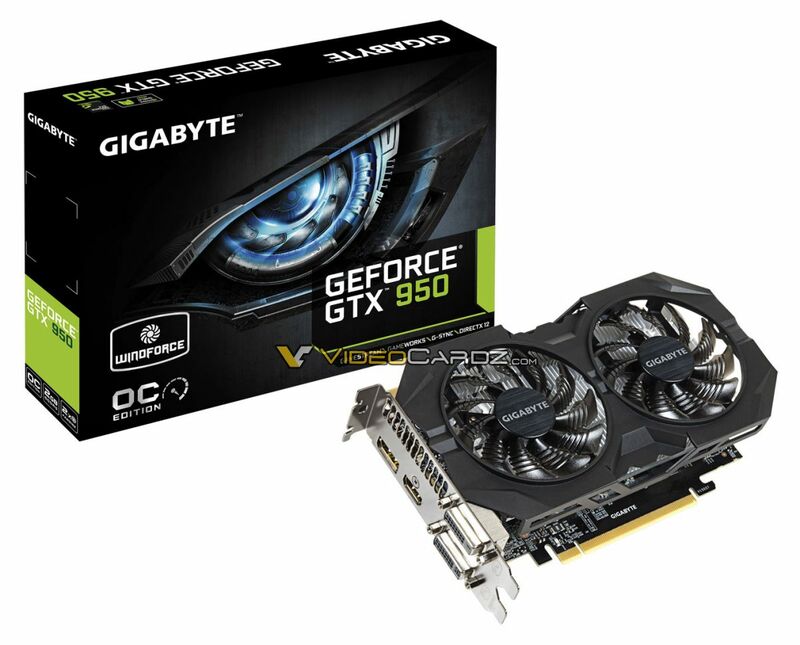 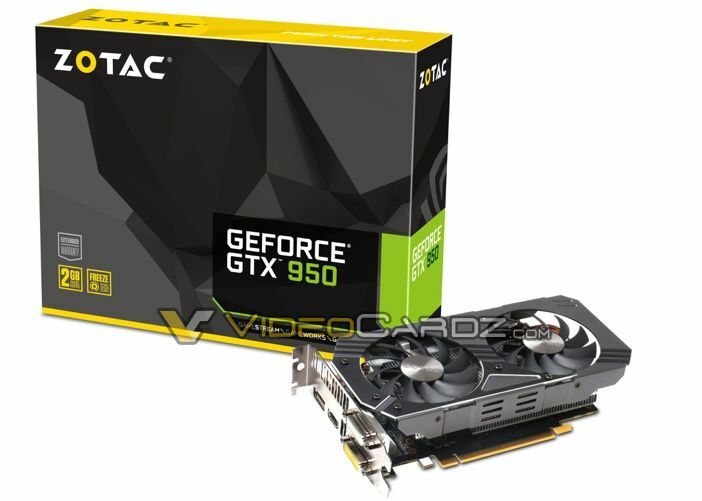 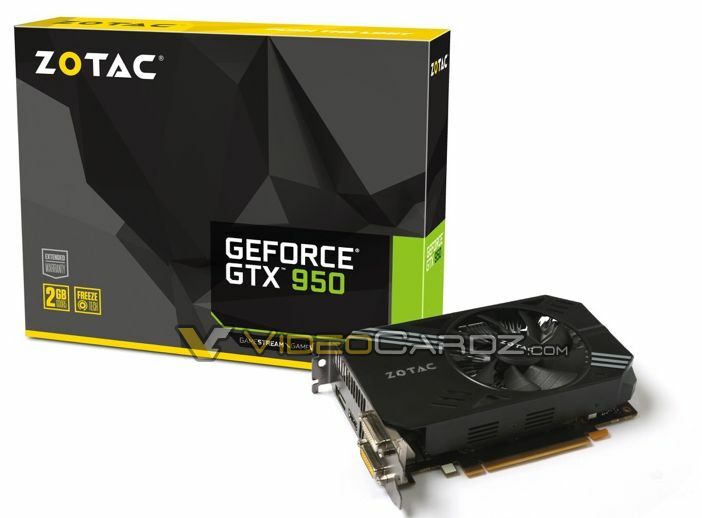 is quite possibly the fastest GTX950 on the market. 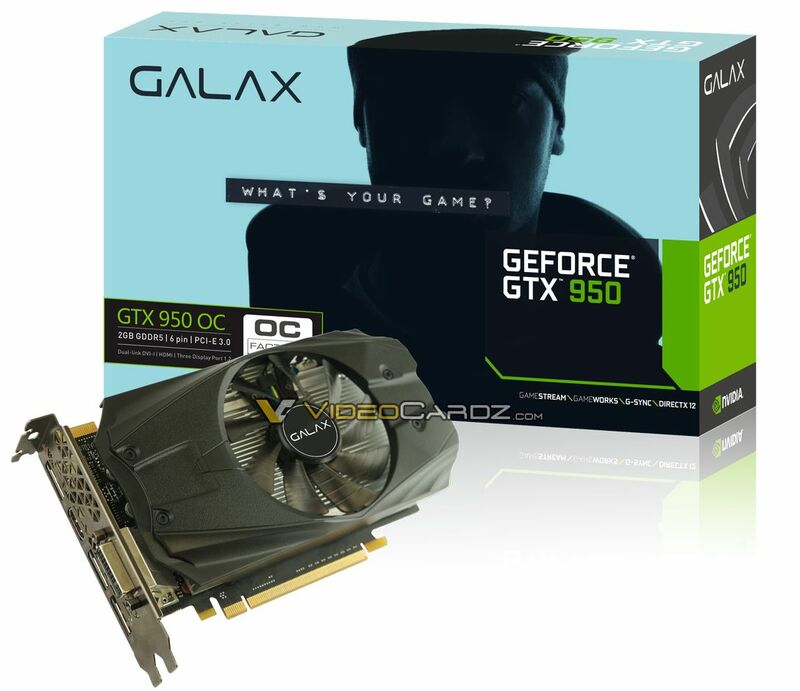 With base clock at 1203 and boost clock at 1405 MHz the only competition would come from higher-tier model like GTX 960.